Summer vacation lasts all year long at LEGOLAND Beach Retreat, all-new accommodations that give guests great new reasons to play — and stay — at LEGOLAND Florida Resort. Under a beautiful blue sky, a cast of kid performers delivered a grand opening ceremony on April 7 set to the Beach Boys classic "Surfin' Safari," ending with a burst of fireworks and volleys of giant foam LEGO bricks. 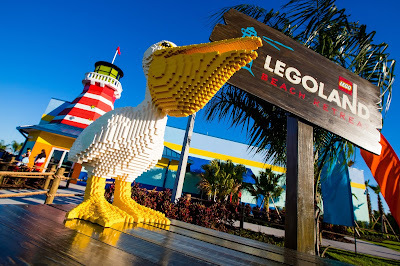 Filled with creative LEGO theming inside and out, LEGOLAND Beach Retreat is a village-style vacation resort featuring brightly colored bungalows in 13 horseshoe-shaped "coves." The fun begins almost immediately, thanks to a drive-through check-in process that will take you from your car to your cove in minutes. Designed to resemble larger-than-life LEGO sets, 83 bungalows offer 166 separate rooms that sleep up to five, including a cozy area just for kids. They're an ideal solution for families and groups traveling together. Each cove has its own outdoor play area within view of the bungalows' shaded patios, where mom and dad can relax while kids romp and run. A giant swimming pool and an adjacent sandy area perfect for building sandcastles, plus the resort's biggest outdoor play structure. Sandy's Castle Restaurant, featuring a delicious menu of entrees, sides and desserts. A breakfast buffet is included with each stay. Bricks Beach Bar, offering an eclectic menu of made-to-order food, drinks and creative cocktails served poolside and indoors. A hands-on LEGO building station where kids can contribute original creations to a huge sandcastle made out of thousands of LEGO bricks. Complimentary transportation to the LEGOLAND Florida theme park. LEGOLAND Beach Retreat represents the latest milestone in the largest period of growth and expansion in the five-year history of LEGOLAND Florida Resort, with theming and architecture unique among the eight LEGOLAND resorts worldwide. Opening less than two years after the 152-room LEGOLAND Hotel, LEGOLAND Beach Retreat more than doubles accommodations at the Florida vacation destination. Nightly rates start at $135 (plus tax and resort fee). To book, visit LEGOLAND.com/florida or call (877) 350-5346 daily from 9 a.m. to 5 p.m. Eastern.